We’ve known for a while now that Prince Harry and Meghan Markle are leaving Kensington Palace—where they are neighbours to Prince William and Kate Middleton—for Windsor Castle’s Frogmore Cottage, where they will be anticipating the arrival of their royal baby. Renovations had begun at the countryside abode since last year, and just last month, the palace announced that a separate household will be created for the Sussexes in Buckingham Palace, who used to share an office as well as a social media account (@kensingtonpalace) with the Cambridges at Kensington. While the couple has not made the move yet—royal commentator Emily Andrews shared that the move has been delayed due to ongoing renovations—they have made the split Instagram official. A new Instagram @sussexroyal was announced yesterday, with a personal message from Harry and Meghan accompanying images of the couple carrying out their duties. “Welcome to our official Instagram; we look forward to sharing the work that drives us, the causes we support, important announcements, and the opportunity to shine a light on key issues. We thank you for your support, and welcome you to @sussexroyal,” the caption writes. The account has garnered a following of 3.3 million at the time of writing, almost half of @kensingtonpalace’s 7.3 million. While fans of the British family’s “Fab Four” are disappointed by the growing distance between Britain’s favourite royal brothers, it’s a progression that makes sense. Ever since the marriage of Meghan Markle to Harry, British and American tabloids have reported that the new Duchess of Sussex does not get along with her royal sister-in-law. From news of Meghan making Kate cry after a stressful fitting for Princess Charlotte’s bridesmaid dress, to Kate confronting Meghan for berating her staff last year—which the Buckingham Palace claims never happened—it hasn’t been pretty for the two duchesses. The narrative changed this year when reports emerged that the rift really was between the brothers, rather than their wives, who may not be the best of friends, but are able to get along amicably, as sister-in-laws do. The feud reportedly stemmed from William’s concerns that Harry’s relationship was going too fast, and Harry’s unhappiness that his brother and sister-in-law were not doing enough to make his American wife feel welcome in the family. However, as more speculations surround William’s alleged affair with Kate’s best friend Rose Hanbury, the Marchioness of Cholmondeley—whom the Duchess of Cambridge is rumoured to have cut ties with—a writer and royal fan is entertaining the idea that the chilliness between the brothers had arisen from Harry knowing about the affair all along. With no official statement from the Buckingham Palace, we’ll never know for sure. While Kensington Palace is famously known to be the home of the “Fab Four”, it is actually pretty crowded. The palace grounds are also home to Princess Eugenie and Jack Brooksbank, the Prince and Princess Michael of Kent, the Duke and Duchess of Kent, and the Duke and Duchess of Glouchester, as well as palace staff. Harry and Meghan’s starter home, the Nottingham Cottage is a 1,300sqft, two-bedroom classic Victorian cottage, which is relatively small by royal standards. Frogmore Cottage at Windsor Castle, which was gifted to the couple by Queen Elizabeth, is a ten-room countryside home about 30 miles west of London, which is perfect for Harry and Meghan’s growing family. The cottage sits in the premises of the Frogmore House, where the couple shot their engagement photos, and subsequently held their wedding reception. Furthermore, the Sussexes have expressed that they hope to raise their child away from the spotlight, and the privacy of the Windsor grounds checks all the boxes. With William, who is in second in line to the throne, preparing for his role as future King, and the Sussexes engaging in their own causes—like Harry’s role in the Invictus Games and Meghan’s support for female empowerment—the separation has always been in the cards. While Harry had previously been the third wheel between William and Kate at royal engagements, the Duke is starting to forge his own path. His duties include charity Sentebale which he formed with Prince Seeiso of Lesotho to aid children in South African country who are vulnerable to HIV, and his patronage with anti-landmines charity the Halo Trust, both in honour of the late Princess Diana. He will also be taking over duties from his grandmother, Queen Elizabeth, on top of his work for the Royal Foundation, an organisation he had set up with William in 2009 to “take forward their charitable ambitions”. And as Harry and Meghan make the move to Frogmore Cottage, a separate royal household is all the more imperative to ensure they have the support they need. 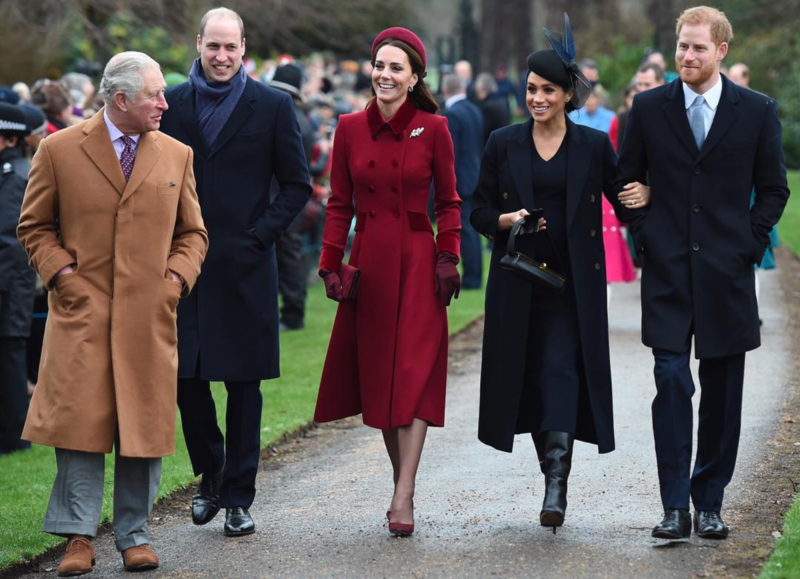 While their household will be separated from the Cambridges, they will not be completely independent of royal jurisdiction, as they have reportedly hoped for. According to The Sunday Times royal correspondent Roya Nikkhah, the couple’s request for complete independence was vetoed by the Queen, and their office will be based in Buckingham Palace, an 11-minute drive from their Windsor home. With Harry and Meghan's baby due to arrive this month, watch our space for news on the Royal family’s latest member. Art & Design What Will Meghan Markle And Prince Harry's Nursery Will Look Like?